It was not until 1963 that the International Committee of Weights and Measures (CIPM) adopted the cesium clock as the world scientific community's standard time reference. It boasted an accuracy that kept it within 1.1 parts in 100 billion, meaning it would not gain or lose more than a second in 3 thousand years. To show how far technology has advanced since 1963, in April of 2014 the National Institute of Standards and Technology (NIST) launched a new atomic clock called NIST-F2 (also cesium-based) to serve as a new U.S. civilian time and frequency standard. NIST-F2 would neither gain nor lose one second in about 300 million years - a factor of 10 thousand. According to the U.S. Navy's official Time.Gov website, the Internet time reported on my computer was 1 minute and 37 seconds behind official U.S. time. This is not surprising since by default Windows only re-syncs with the network once every 7 days. That means my computer clock isn't much more accurate than a cheap old spring-driven wind-up watch. Going into the clock settings window and clicking on the "Update" button brought the computer clock back into sync with the NIST server clock. The work of the NBS on atomic frequency standards and their accuracy. Included is a description of the U.S. Frequency Standard, which can control clocks that could run 3000 years without gaining or losing over a second. 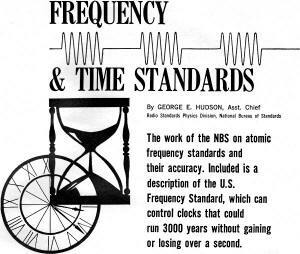 In recent years, the National Bureau of Standards has been conducting developmental research on the precise measurement and generation of frequency and time. For radio communications, the tracking of satellites, the control of long-range rockets, and astronomical observations, timing accuracies of one part in a billion or better will be required in the future. 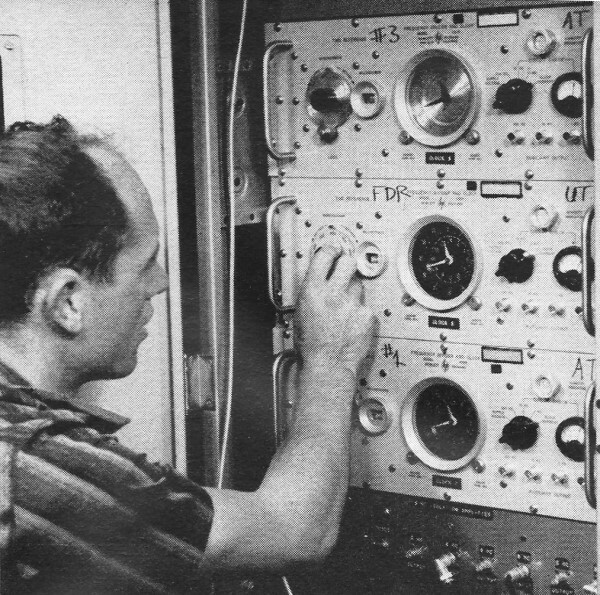 Many scientific and engineering activities rely on regular radio transmissions of standard frequencies from Bureau stations WWV, WWVB, WWVL, and WWVH and from the Navy's NBA to provide high accuracies. These broadcasts are based, in part, on astronomical observations related to the earth's rotation as made by the U. S. Naval Observatory. However, to meet the ever-increasing need for even greater accuracy, the Bureau has been investigating atomic frequency standards, which are a thousand times more precise for time-interval determinations than the earth's rotation. Let us first consider a device which actually realizes the limits of accuracy with which we are able to generate and determine frequencies - and times-for the present. 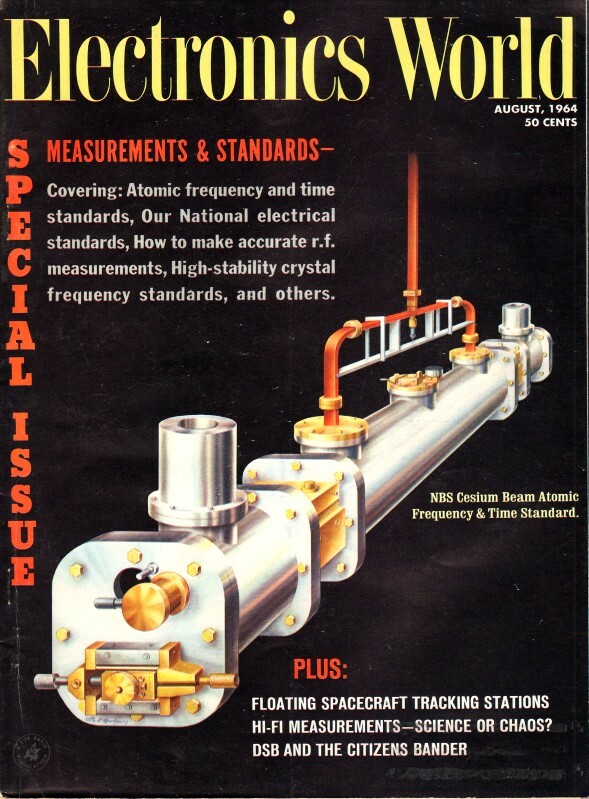 This is the United States Frequency Standard, illustrated on the cover and in the various accompanying pictures and diagrams. It is located in Boulder, Colorado, in the Radio Standards Laboratory of the Institute for Basic Standards - one of the four Institutes which now comprise the National Bureau of Standards. 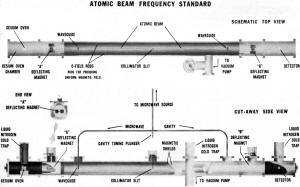 For some time now the primary standard for frequency in the United States has been an atomic one. Up until now the most precise such standard has used a cesium beam, undergoing a hyperfine dipole structure transition using magnetic resonance as its controlling element. In effect, the cesium atoms are constantly spinning in such a way as to produce magnetic poles having a certain orientation. Under certain conditions of excitation, the atoms appear to suddenly "flip over" or reverse their spin direction and the magnetic poles reverse. The cesium beam frequency standard is essentially an atomic beam spectrometer which emits a signal only when the frequency of radiation introduced through a waveguide into the cavity through which the beam is passing is precisely equal to the resonance transition frequency. This frequency is actually in the microwave region. The presence or absence of the signal indicates whether the frequency of the radiation, itself generated by a quartz-crystal oscillator driving a frequency multiplier chain, is within the allowable tolerance limits. In practice, the quartz signal generator is manually or automatically varied over a narrow band to find the "center" frequency. When the spectrometer output is at a peak, the signal generator frequency is known within ±0.1 cps or 1.1 parts in 1011 (a hundred billion). Automatic equipment is used to control the signal generator so that the spectrometer output stays at the maximum. This provides a signal of known and nearly constant frequency for as long as the device can be kept running. As the separations of the quantum states of an isolated atom are fundamental constants of nature, they provide a stable, reproducible standard of frequency and time interval when the atomic beam resonance technique is used. Previously, the most uniform time-intervals available were those derived from astronomical observations of the rotation of the earth relative to the fixed stars. This was corrected to the orbital motion of the earth about the sun. The orbital motion of the earth at 12 hours (noon, E.T.) on January 0, 1900 (December 31, 1899) is the basis of what is called Ephemeris Time (E.T.). In 1956, the second of Ephemeris Time was adopted as the fundamental unit of time by the International Committee of Weights and Measures (CIPM) and this action was confirmed by the General Conference on Weights and Measures in 1960. Steps were taken by the Conference toward the adoption of an atomic standard for time-interval. In early December of 1963, the Consultative Committee for the Definition of the Second of the CIPM met in Paris. This committee recommended, among other things, that the cesium frequency should serve as an international provisional standard on which the atomic second of time should be based. Research, of course, should continue as to the best atomic standard, but it recommended that the astronomical second be dropped except as needed for celestial mechanics. A time scale approximating Ephemeris Time can be made immediately available by the use of atomic standards, quartz-crystal oscillators, and counters. In terms of the ephemeris second, the frequency of the cesium transition has been experimentally determined to be 9,192,631,770±20 cps. The probable error, ±20 cps (or 2 parts in 109), results from the limitations on the precision of the astronomical measurements. Consequently, it is common practice now, and in line with the policy that the atomic frequency transition studied at the Bureau of Standards is the primary one for the United States, to take the frequency of the transition to be exactly at 9,192,631,770 cps (or 9192.63177 megacycles) . To avoid inconsistency, we must regard the error quoted of 2 parts in 109 to be the error in determination of the ephemeris second in terms of an exactly defined atomic second. Such a definition is being currently considered. If the cesium transition is adopted for this purpose, one second of atomic time will consist of 9,192,631,770 cycles of the electromagnetic radiation absorbed or emitted by a cesium atom in changing its state. The physical picture in this particular case is that the magnetic dipole moment of the cesium atom changes because of a spin transition. Measurement of a frequency or a time-interval in terms of the cesium transition can be made with a typical precision of 1 part in 1012 and is not limited by the instrumental difficulties involved in astronomical observations. See Fig. 1. Until official action is forthcoming it can not, however, supplant the present definition of a scale for time based on the non-uniform apparent motion of the sun. Fig. 1. 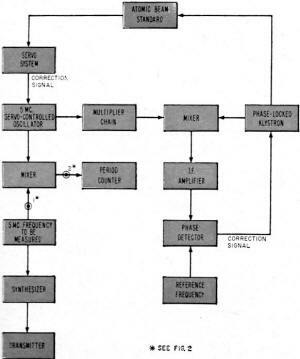 Simplified block diagram of the frequency measuring system which utilizes the cesium beam U.S. Frequency Standard. It seems natural to base the standard of time-interval on the physical process that provides the most uniform and most accessible interval. The precision of measurement for the atomic standards is a hundred times better over a 15-second period than astronomical measurements made over a period of 3 years. Also under investigation as a standard of frequency is the thallium atom, which has certain significant advantages over the cesium atom in this application. However, thallium may have some disadvantages in practical use. A thallium beam is now in operation at the Boulder Laboratories to determine which of the two atomic systems is more suitable. At the present time, radio transmissions controlled by the Bureau's master quartz-crystal oscillators are being monitored with cesium beam frequency standards. Corrections for the 60 and 20 kc. standard frequency broadcasts from NBS radio station VVWVB and WWVL at Boulder, Colorado, are being made regularly and are available on request from the Broadcast Service Section of the Bureau's Boulder Labs. The time generation system now employed at the Boulder Laboratories comprises the most accurate clock that man has ever known. Fig. 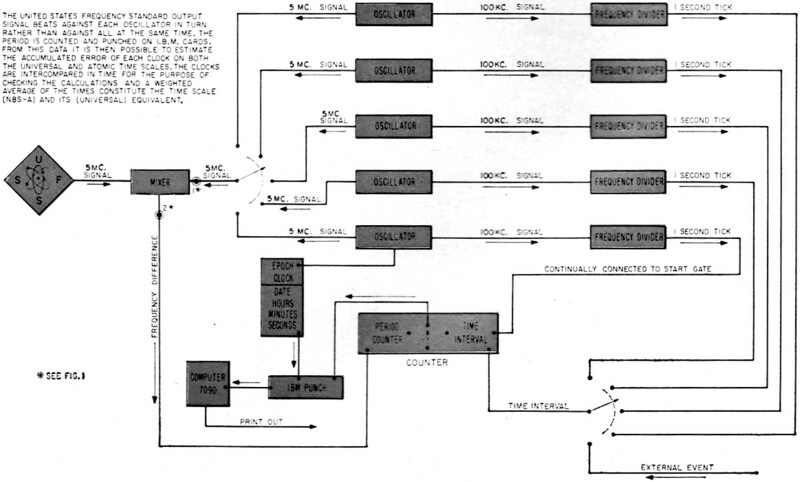 2 is a schematic diagram of this system, which generates the NBS-A time scale. W. Atkinson, L. Fey, and J. Barnes have been chiefly responsible for its development. Fig. 2. A simplified block diagram of the NBS-A atomic time-scale generator. The U.S. Frequency Standard, shown in Fig. 1, beats against each of the five oscillators in turn. After a time intercomparison, a weighted average is used. Recent comparisons with other time scales - such as those of Essen in England and particularly Bononomi in Switzerland - the so-called TA1 time scale - have shown agreement to within 1 part in 1011 over about a two-year period. This means that these time scales diverge at the rate of 1 second in 3000 years. period of rotation on its axis. After correcting for longitude effects on the astronomical observations which yield UT-0 directly, one obtains UT-1. Then correcting for seasonal variations in rotation speed one obtains UT-2. The U. S. Naval Observatory obtains a composite "atomic" time scale - known as A1, by taking a weighted average of various atomic standards from the United States and European laboratories. The average is obtained from broadcast transmissions. However, propagation effects lead to many technical questions which remain to be investigated: The Naval Observatory publishes the difference between A1 and UT-2 regularly. Scientists are shown above pouring liquid nitrogen (at a temperature of -320° F) from a Dewar into one of the cold traps in the NBS "atomic clock" at the Boulder Laboratories. The nitrogen lowers the temperature in the evacuated tube and causes stray gas molecules and other impurities to condense around the cold end of the trap. This reduces the chance of collision between the cesium atoms and molecules of air, thus improving the vacuum and increasing cesium-beam accuracy. On the basis of the NBS-A atomic scale which has been kept continuously since the Fall of 1957, it is known that the UT-2 scale, which really is simply an average representation of the earth's rotation, shows that the earth has slowed down by about 2.9 seconds in this time. It is clear that the uniform atomic time scale NBS-A generated at the Boulder Laboratories and based on the atomic frequency standard must be heavily relied on for the serious business of accurate time-keeping. It is also clear that the United States is maintaining its eminence in this field. The principle of keeping time with an atomic clock is simple. If one has a continuous record of the frequency, f, of any oscillator and a concurrent record of the number of cycles of vibration, or phase of the oscillator, then the time interval between two given phases can be calculated. If one plots the quantity 1/2πf versus the phase, the time interval is just the area underneath the curve between the two phase values. Now to do this one must have a continuously running oscillator, or several oscillators (for redundancy and to increase statistical reliability) and measure their frequencies periodically by comparison with the atomic standard. Then one must also count the cycles generated by the oscillators with a suitable counting circuit. The NBS-A time scale is generated essentially in just this way. To account for the tiny variations in frequency of the oscillators used (four quartz ones and one rubidium one) intensive studies have been and are being made of their physical and their statistical characteristics. The result is a clock whose accuracy in keeping time is only limited by the accuracy of the U.S. Frequency Standard itself. There is not one but five complete time keeping systems in the fail-safe setup shown in Fig. 2. A weighted average of the five leads to the NBS-A atomic time scale. Signals from this system control the broadcast frequencies and time furnished by the Bureau, under the direction of Mr. D. Andrews. A recent innovation utilizing a phase-lock system insures that the time signals emitted by WWV are in phase with the NBS-A scale to within 25 microseconds. It is only at certain intervals, as the earth gradually changes its rate of rotation, that shifts must be broadcast so that all the signals simultaneously are kept in agreement with UT-2 furnished by the Naval Observatory. Between times, the rate of time ticks is atomically controlled. Thus the Bureau of Standards must maintain two time scales simultaneously under its NBS-A system. An NBS scientist is shown retarding by 0.1 second on April 1, 1964 the clock which maintains Universal Time (UT) at the Boulder Laboratories. This 100-millisecond adjustment was necessary due to changes in speed of rotation of the earth, as determined by astronomical observation. Center clock (being adjusted) is kept in close agreement with UT-2 (GMT). The top and bottom clocks, which are controlled by the U.S. 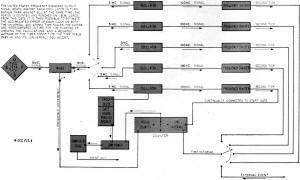 Frequency Standard and which are not adjusted, maintain atomic time and were in agreement with UT-2 on Jan. 1, 1958, as determined by the U.S. Naval Observatory. Since that time, the clock maintaining UT has lost about 2.9 seconds relative to atomic time. Since UT-2 is determined by the earth's rotation (which is slowing down), the center clock must be retarded periodically and progressively loses time (150 x 10-10 sec./sec. for 1964). 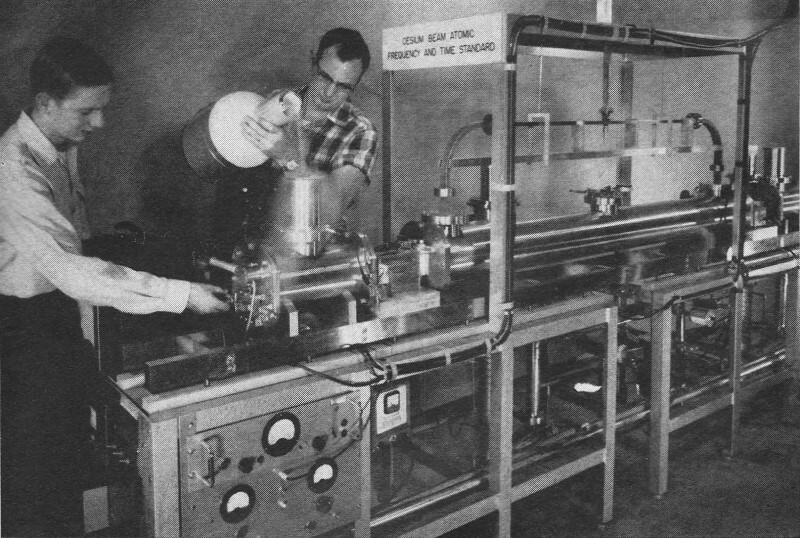 The atomic beam spectrometer, which is the heart of our frequency and time measuring system, is shown in cross-section in one of the photos. Neutral cesium atoms effuse from the oven and pass through the non-uniform magnetic field of the deflecting magnet. As the atoms act as miniature bar magnets (they are said to have a magnetic dipole moment), a transverse force will act upon them in this non-uniform field. The magnitude and direction of this force depends upon which of the energy states the particular atom is in. Of all the atoms effusing from the oven, suppose those with nuclear and electron spins in the same direction, say up, have their trajectories bent toward the axis. Atoms on the other side of the center line with spins in opposite directions, with the net being down, will have their trajectories bent toward the axis also. Note that atoms with upward spins and those with downward spins experience forces in opposite directions. The upward-spin atoms and the downward-spin atoms will cross the axis at the collimator slit, pass through the slit, and enter the region of the B deflecting magnet. AAs the B magnetic field is exactly like that of the A mag­net, it exerts the same transverse force on the atoms as does the A magnet field. The upward-spin atoms will expe­rience a downward force as before and the downward-spin atoms will be acted on by an upward force, as before. As the two sets of atoms are now on opposite sides of the center line of the evacuated tube (compared to their previous positions), these forces make their trajectories more divergent. However, if a radiation field is applied at just the proper frequency (which matches the energy separation of the two quantum states), transitions between the two states will occur in the region between the A and B magnets. The spins will be reversed in the two beams, and a quantum of energy will be either emitted or absorbed. Since the sign of the magnetic moment has changed in moving from the A magnet to the B magnet, the force on these atoms will reverse its direction and the atoms will be re-focused onto the axis at the detector. Thus, as the exciting radiation is swept in frequency, the detected signal will increase and reach a maximum at the critical frequency, and then decrease as the radiation frequency is varied on either side. We have tried to furnish some notion of the intense activity which is now current at the Boulder Radio Standards Laboratory of the National Bureau of Standards' Institute of Basic Standards. Highly accurate atomic standards exist at the Bureau-but they are constantly being improved and modified as the state of the art progresses. A hydrogen maser is under development and will soon be ready for comparison with the cesium beam frequency stand­ard. Commercial varieties are now available which hold considerable promise of being at least competitive with the presently used standard. The adoption of the definition of the atomic second as the international standard of time seems to be in the imme­diate offing. 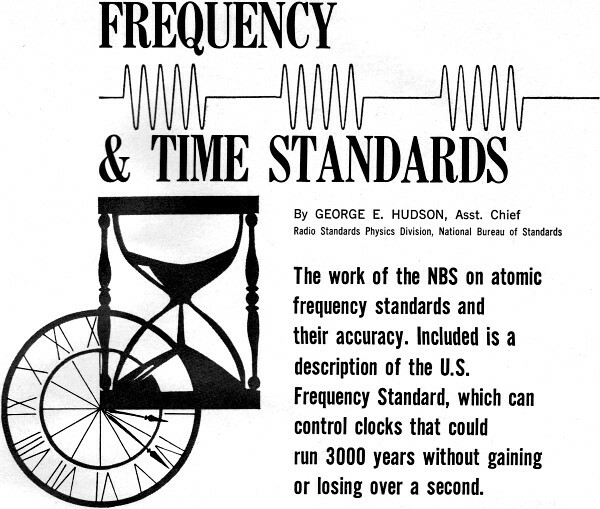 The NBS atomic frequency standard itself con­trols the rate of the very accurate atomic time scale and the broadcast information, whereby industry and the scien­tific community can feel confident that it is receiving the best and most up-to-date services available in the area of frequency and time. The author wishes to express his thanks for and acknowl­edgement of the contributions made in the writing of this article to his associates at NBS (BL). 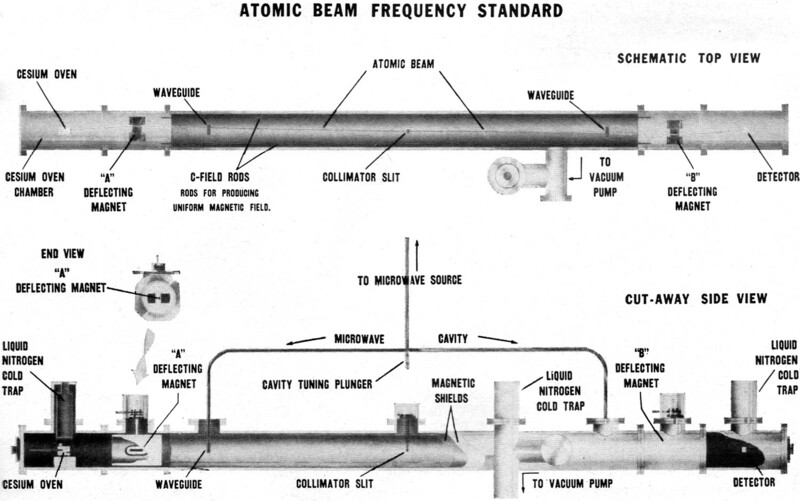 Cut-away scale drawing of the NBS cesium beam frequency standard, or "atomic clock," shows the location of the cesium oven at the left end where the cesium atoms are emitted; the deflecting magnets at each end which bend the beam and direct it through the collimator slit to the detector; the microwave cavity and waveguide, which introduce the microwave frequency; the three liquid nitrogen cold traps used to remove, by condensation, impurities not removed by the vacuum pump; the magnetic shields, designed to eliminate the influence of terrestrial and other outs ide magnetic fields; the hot-wire detector at far right end where the beam impacts and is detected. This equipment is essentially an atomic-beam spectrometer excited by a crystal oscillator driv­ing a frequency-multiplier chain. The radio waves, oscillating a t a frequency close to the vibration-per-second rate of the cesium atoms (9192.63177 me.I, are tuned slightly so that they match the atomic rate. When they match, the radio waves are absorbed; the radio frequency is then the same as that of the cesium atoms-and a near absolute standard is available. The device can measure an unknown frequency with an accuracy of 1.1 parts in 1011 (one hundred billion). This is equivalent to measuring the width of the United States with less error than the thickness of this page. Its stability is even higher-at least a few parts in 1012 per year-and at the present time these figures represent one of the best achievements in this field in the entire world.